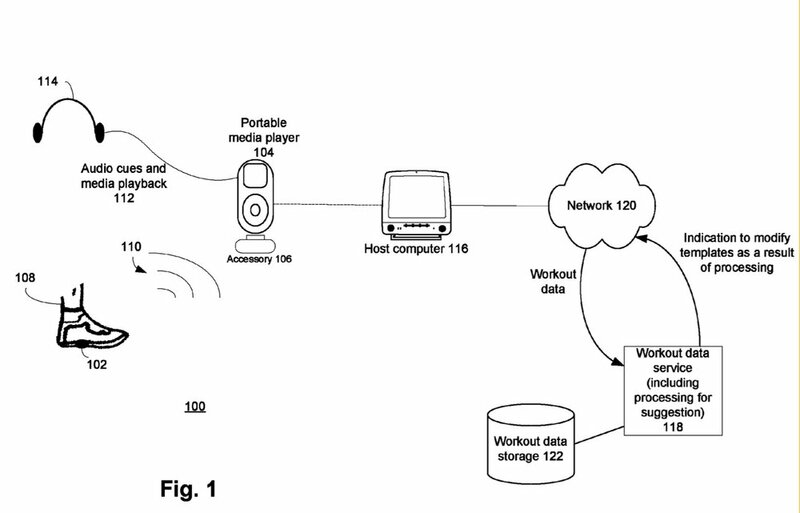 Apple has been granted a patent (number 9,868,041) for an “integrated media jukebox and physiologic data handling application.” With roots going back to 2006, the patent originally involved syncing an iPod with your Mac. Now it includes more devices, including the Apple Watch and a “foot mounted unit,”and more data than music. Among that data is exercise performance information. Devices such as simple mechanical pedometers have been used to obtain information relating to walking or running. A typical mechanical pedometer is a standalone device that merely displays an indication of number of steps taken which, typically at most, can be converted to distance traveled by multiplying the number of steps taken by an estimated average stride size. Apple is apparently interested in a foot-mounted unit, including a sensor for sensing motion of the foot of a user, is configured to provide motion information wirelessly--to a wrist-mounted unit (an Apple Watch). The smartwatch includes a display for displaying information to the user based upon data accumulated by the foot-mounted unit and transmitted wirelessly to the wrist-mounted unit.